I’m on a roll with these criminal type characters; all of them mostly into drugs. Johnny from We’ll All Be Burnt in Our Beds, Daniel from In the Cage, and now Jared. Jared is different, though, in a significant way – he’s still a teenager, living at home with his mother. Except for the times when his mother’s in a mood and he stays with a friend for a while. Jared’s had a rough go of it; his maternal grandmother thinks he’s the Trickster and doesn’t like him (“Get, you dirty dog’s arse.”); his mother has a volatile personality (and colourful language); his father left them for another woman and, unbeknownst to his mother, Jared’s been helping him out with his bills using his “cookie” money; he’s been abused by one of his mother’s ex-boyfriends; his mother and her new boyfriend go off for days at a time leaving Jared home alone; he recently lost his beloved pitbull, Baby Killer. And those things don’t even touch what goes on at school and with his peers. He wanted to believe his mom was sorry, but his dad was always sorry and he still kept doing crap he had to say sorry for. He didn’t want to be a sucker, but he didn’t want to be alone. Everything ached and all the choices felt wrong. The one constant person he has in his life is his paternal grandmother. They text back and forth whenever he feels the need, and she ensures him he can come live with her whenever he wants. Her unconditional love is his only safe place in an otherwise crazy world. Which is hard for someone with a compassionate personality like Jared’s. Incredibly, considering Jared’s rocky upbringing, he’s a caring person – he cares about his dad, his step-sister and her new baby; he cares about the boy who is a bit of an outcast because of his nerd-ish temdencies; he cares about his elderly neighbours and their eccentric and lonely granddaughter. In fact, he seems to be the only responsible one around. Where did he get this huge capacity for compassion? He wished people could make undying declarations of love and loyalty to him when they weren’t half-cut or stoned out of their gourds. Or sorry. Just when life probably couldn’t get much worse for Jared, he finds himself noticing strange things like talking birds, wandering cavemen, and people with monsters shimmering behind their faces. He thinks he’s losing it and needs to lay off the drugs and booze for a while. But things just keep getting worse. The bites had healed. He didn’t feel his missing toe anymore. he should be over it by now, he thought, but as he treaded water, he wanted to get drunk, immediately. He wanted to not feel terrified or dumped or used anymore. He wanted to get out of his head and never, ever crawl back in. At first, I didn’t know how I was going to feel about the magic realism in the book. 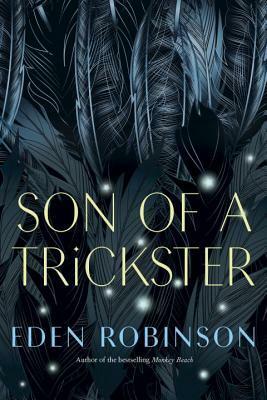 But Eden Robinson is skilled at combining the real with the supernatural. And humour. Humour might be her secret ingredient. Jared uses humour as defence against his friends, his dysfunctional family, himself, and the mind that he thinks he’s losing. And it all works; so well that I was sorry to see it end and happy to hear there’s more coming. I think this book is just about perfect and I’d be happy to see it win the Giller. With all the power of technology and science in the world, I would bet you dollars to doughnuts that you still trust a human face to be a human. But come closer and let me speak to the creatures that swim in your ancient oceans, the old ones that sing to you in your dreams. Encoded memories so frayed you think they’re extinct, but they wait, coiled and unblinking, in your blood and your bones. Interview on The Next Chapter, where Eden Robinson talks about being “tickled” by the idea of having characters from mythology show up in the present. I normally have problems with anything touched by magic realism but when this becomes available in the UK I will probably try it. Only the audiobook is accessible here at the moment. I think, for me, it depends on how it’s incorporated into the story. I find that I often hesitate to pick up a book that is said to include magic realism, but then I end up being fine with it. There was a point, though, in this book when I wasn’t so sure, but then I came out of it wishing it wasn’t over! Is this one your favorite of the Giller nominees? Sounds pretty dark; I wonder how the magical realism will effect the story, seems to uplift Jared. But it’s not as rough as Burnt in Our Beds? Jared sounds more compassionate than Johnny? Overall, I found this book gentler than We’ll All Be Burnt in Our Beds. The humour in the book isn’t as dark as Johnny’s. Maybe also because the protagonist is a teen and he’s not completely alone? Johnny has nobody. I think this is a favourite for the Giller so far, but I still have two books to read! I loved this book just as much and can’t wait to dig in to the rest of Robinson’s work. Have you read Monkey Beach? I highly recommend it as well. No, this is my first time reading one of her books. What has taken me so long?! Reading this novel – which you already know I loved – reminded me of reading Banana Yoshimoto’s Kitchen; in both books there are elements which can be seen as magical realism but in these stories they simply feel like part of the story, and naming them anything in particular feels contrived somehow. Like, I can’t imagine the story being told without those elements, so how can they be separated out and catalogued – it’s so much all-of-a-piece. I still have two books to read on the Giller shortlist, but so far, at least, I’d be content to see this story scoop a major prize, and I hope it’s a contender for some international awards too! Like you, i was a bit skeptical when I realized this book was magic realism, but you’re right, I think the humour makes everything come together really nicely. Eden was a lovely reader at the event I attended, and she seems like a genuinely nice person, so I’ve got my fingers crossed that she wins too! I would love to hear her in person. She’s always fun to listen to on the radio! I loved meeting her in person… her laughter was infectious and she was a fantastic speaker that had the audience laughing right along with her. I like magical realism and this sounds really intriguing! I think you’d like this then! Magical realism and criminals. Huh. Despite the fact I loved Monkey Beach, I’ve not read any Robinson since, I have no idea why. This sounds absolutely brilliant, I’ll definitely be looking out for it on publication in the UK. From what I’ve heard, if you like Monkey Beach you’re likely to also like this one, I’d love to hear what you think!